Bolt on a C6 Corvette 2005-2013 SLP Loud Mouth II Exhaust With Round Tips on your C6 Corvette for gains up to 12 extra horsepower. The tone is rich and powerful letting everyone know you're coming, with an aggressive rumble your LS3 deserves. The secret to the system's distinctive sound and performance gains are a pair of polished stainless Loud Mouth II bullet-style mufflers, stamped with our SLP logo. This system features a distinctive black cast aluminum tip with four polished outlets, providing you with the ultimate Corvette look. 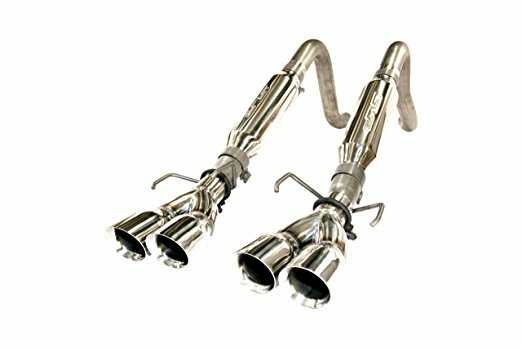 The rest of the exhaust system is hand-crafted from stainless steel, and is covered with our Limited Lifetime Warranty. Note: Cast aluminum exhaust tips may have slight imperfections from the casting process which we deem acceptable. NOTE: Due to the dimensions / weight of this item, freight charges will be applied at check out. Q: With this purchase, is it both sides? Q: will they drone on a 2011 c6 corvette and if they do which exhaust would you recommend?